Packing a lot into a small package, the CSD-TD69's combination of CD player, cassette player, and radio is sure to delight. The unit offers CD-R/CD-RW playback, CD repeat and program play, a digital-synthesized tuner (for drift-free station tuning) with 30 station presets, a tape counter, full-logic cassette performance, and a headphone jack for private listening. The preset graphic equalizer (rock, pop, jazz) delivers high-fidelity sound with acoustic realism. Multiple equalization curves assure timbral adjustments that match your musical preferences and listening conditions. Aiwa's bass reflex cabinet incorporates independent enclosure space for the left and right speakers, and a cylindrical port lets the speaker move more air, increasing bass response. Super T-Bass, meanwhile, accentuates music at low frequencies for even more pronounced bass. A sleep timer turns the unit off automatically at a specified time (five to 120 minutes), so you can fall asleep while listening to the radio, CD, or cassette tape. 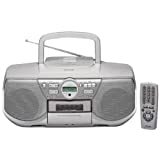 The boombox comes with a remote control.